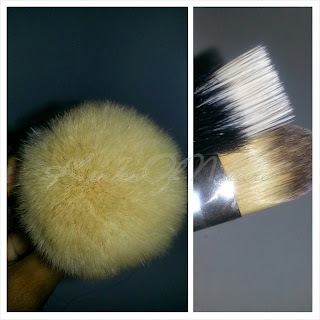 Brushes after using Bobeam Vashti Ayurvedic Shampoo Bar. Quick tip: Try using your shampoo bars to clean your makeup brushes. After a few weeks of not properly washing my makeup brushes and just putting them aside, I finally took the time to clean them..all of them! I knew I'd need something strong to remove the concealers and liquid foundation. I remembered seeing a couple videos on brush soaps and got the idea to try using my one of my Bobeam bars, the Vashti Ayurvedic Shampoo Bar. I rubbed the wet bristles directly on the bar, rinsed and squeezed out the excess water. To my surprise, it was the quickest I've ever cleaned my brushes and also the cleanest I've ever been able to get them. I've had most of my brushes for at least 5 years. Even with frequent cleaning, the bristles become stained over time, but after using the Vashti Bar, the white and off-white bristles that were stained returned to their original color or close to it. Needless to say, I was and still am beyond impressed. There are a few brush soaps on the market, but this is a less expensive and multi-functional alternative. I'm going to continue cleaning my brushes with Bobeam. Look out for more quick tips in the future. If you want to see my review of Bobeam bars on my hair, click here for the initial review and here for the updated review.